Now we get to the tricky part: distinguishing between nuts eaten by apodemus mice (woodmice and yellow-necked mice) and dormice. 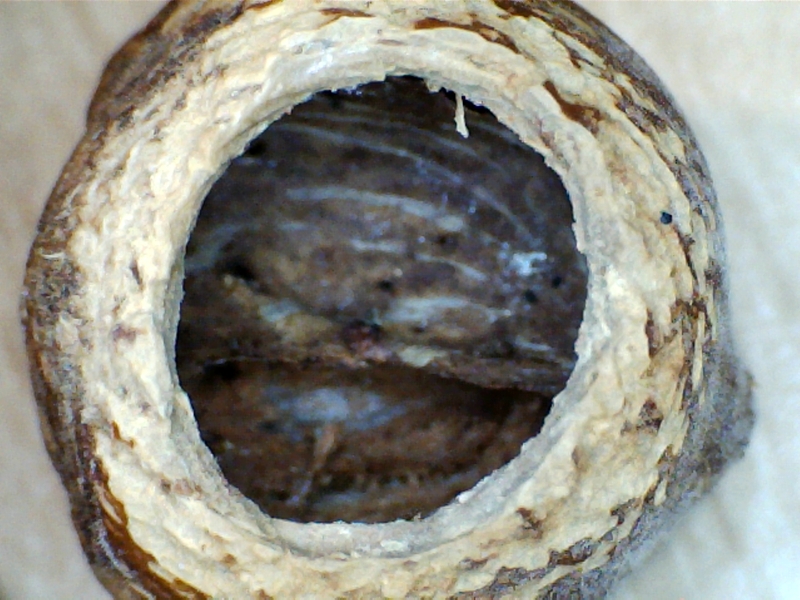 Both sorts of mice nibble neat round holes in the shell, so you need to look closely. A hand lens or magnifying glass helps. A hole nibbled by an apodemus mouse will have teeth marks going down the edge of the hole (vertically). They leave more scratches on the outside of the shell than bank voles. Hopefully you can see both those features in this picture. 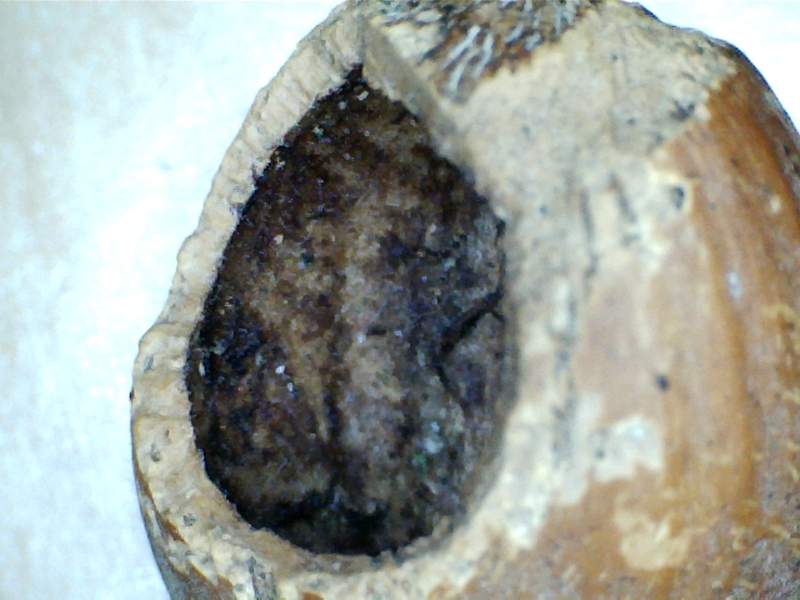 Nut nibbled by a dormouse. 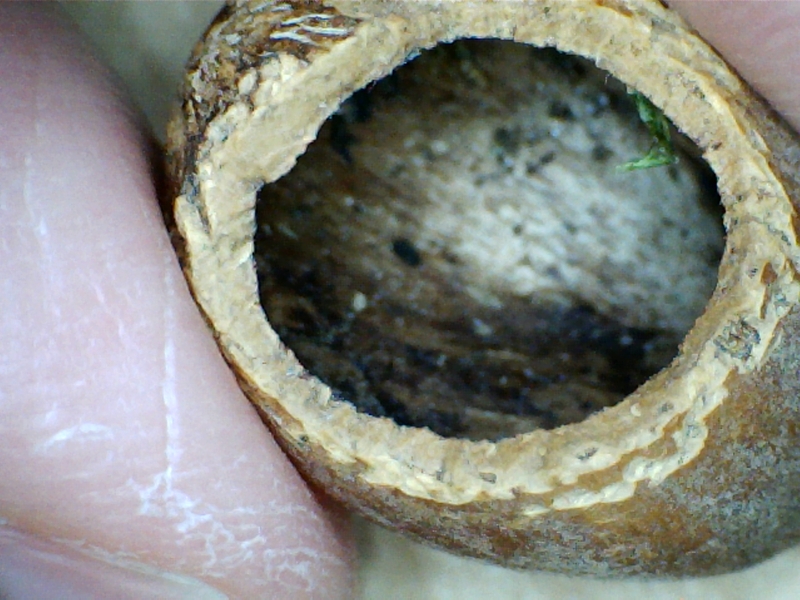 Note the smooth inner surface of the hole, and the scratches outside the hole. 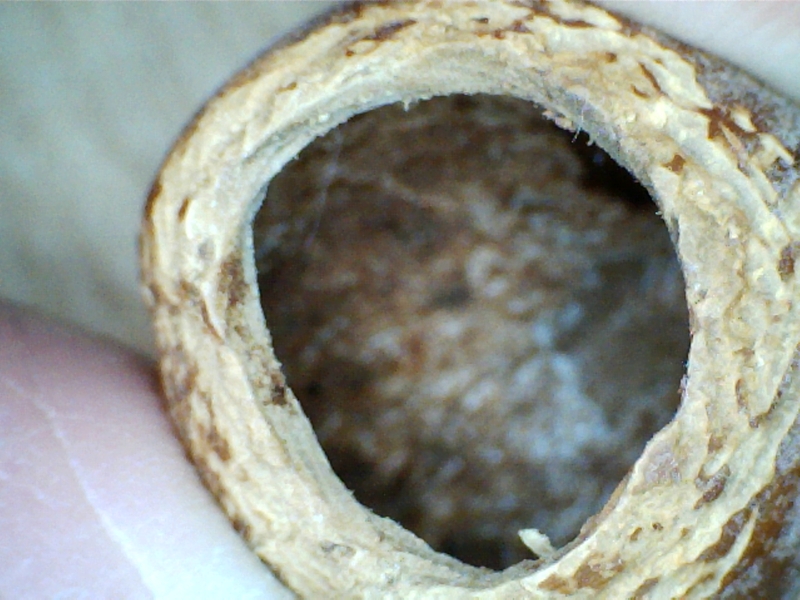 The inner edge of a hole made by a dormouse will be much smoother, as they gnaw around the hole, rather than down. But they do leave lots of scratches around the outside of the hole. Another clue to help you tell the difference between apodemus and dormouse nibbled nuts is where you find them. If you find a cache of nibbled nuts, it’s likely to be apodemus. Dormice generally tend to eat and then drop nuts where they find them, so their nuts are often more spread out. If you find a nut with a really tiny hole (maybe 1-2mm across), this has probably been eaten by an insect. Nut A: who’s eaten it? Nut B: who’s eaten this one? Here are a couple more close-up photos of nibbled nuts. Can you tell what’s eaten them? I will put the answer in the comments to this post. Let me know how you get on. I’m starting to put together a page of photos of mammal signs. This will develop as I delve into my archive, and take more photos. I hope this will eventually become a useful reference (particularly as many books have line drawings rather than photos of these sorts of things, which can be rather hard to interpret). I’ll let you know when it goes up. This is a really great post and the pictures were very helpful. I am pleased to announce that I answered correctly! I took the pictures with a usb microscope, which was good for getting the details. I’ll have to think of what else would be good to get close ups of… Let me know if you have any ideas! I’ll get thinking!… First thought – Do you do much owl pellet analysis? Might be able to get some good shots of the skulls/ dentition? Thanks, good idea – I’ve only done owl pellet analysis once, but will look out for some more pellets to try it out on! Thanks. I hope you find lots of nuts nibbled by dormice! Although it’s easier to find hazelnuts in early autumn, before all the leaves hide them.